Call it a propaganda film -- made to order for the U. S. Army Air Forces -- and sold (for the Aid Society Trust Fund) at a phenomenal figure. Call it purely topical, or what you will. But somehow Steinbeck has succeeded in making it live, and it is a sure seller in book form for everyone interested in knowing what goes on behind the scenes in the making of a bomber team, the unity of thought and action in back of such team work. Steinbeck has only praise for the calibre of the men, drawn from all walks of life, tested on all planes, and found right for the stiffest course of training in the armed forces today. The reader follows step by step that training, sometimes in general terms, sometimes through the experiences of individuals in training as pilot, navigator, crew chief, bombardier, gunner, radio man -- the six jobs that make up the crew. 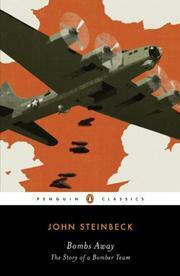 Not as tight writing as Steinbeck usually does -- but good reading.